D is total distance from our star, Sol, to destination. This table independently varies value from 1 to 10.
tAcc is acceleration duration from departure til start of cruise. This case study proposes a monotonic increase of this duration as shown. This method could shorten lengthy cruise times, but fuel consumption tradeoffs must be carefully considered. VFin is final velocity achieved after applying g-force propulsion for tAcc duration. vFin is also the maximum velocity achieved during the flight. vFin is also cruise velocity; for this case study, it increases in correlation with acceleration duration. dAcc is acceleration distance. It also increases in correlation with acceleration duration. dDec is deceleration distance; it equals acceleration distance. 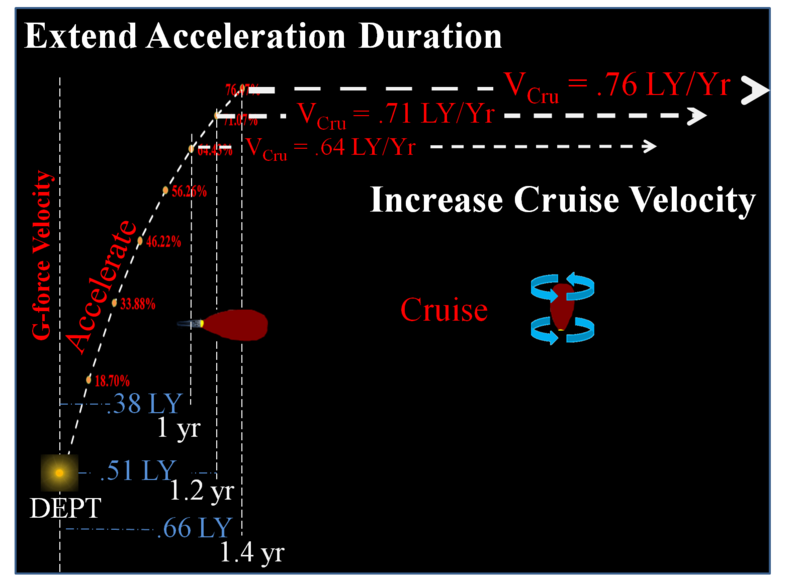 dCru is cruise distance; it equals total distance minus distances for acceleration and deceleration. tCru is cruise time as observed from the Earth. tDec is deceleration time. Assuming consistent g-force, deceleration time equals acceleration time. AXIOM. Light speed is absolute and puts limits on interstellar travel. Even at light speed, interstellar flights take years for photons, virtually massless particles. Since human spaceships will contain large quantities of mass, the best we can hope for is to approach light speed; we can never attain it and certainly never surpass it. ASSUMPTION-1. Self Contained Fuel. Prior to departure from Sol, notional spaceship will collect and carry sufficient fuel for planned propulsion phases to destination. ASSUMPTION-2. Earthlike Gravity. We currently know two methods to achieve Earth like gravity on an interstellar vessel. Constant G-force Acceleration. If an onboard propulsion system can increase ship's velocity by 9.80665 m/s for every second of "powered" flight, then ship's contents will feel a force equivalent to Terran gravity in the direction opposite to propulsion vector. ASSUMPTION-3. Cruise Phase. TE considers it axiomatic that interstellar distances are so great that any interstellar voyage can easily require fuel consumption greater than 100% of ship's mass to power entire flight. Thus, the powered portions of flight (acceleration and deceleration) must be limited. Thus, an interstellar voyage must include a nonpowered cruise phase. Thus, TE assumes following flight profile. Acceleration Phase. Ship starts off trip by accelerating at g-force for a given duration. TE arbitrarily chooses a base line duration of one year, but this acceleration duration can be extended within fuel limitations. During g-force acceleration, ship occupants will feel a gravity like force drawing them back to departure, Solar System; thus, "up" will be toward destination, and "down" will be toward Sol, departure star. Cruise Phase. Due to fuel considerations, ship will stop propulsion after a planned duration and will maintain constant velocity. Fortunately, g-force acceleration for a year or more brings the ship to a significant portion of light speed, c, and reduces cruise duration from centuries to just years. 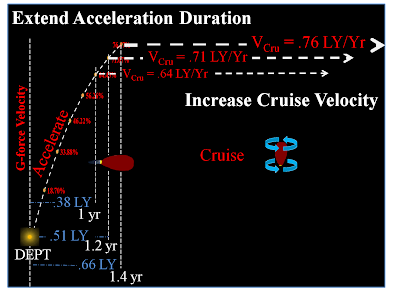 Thus, ship will maintain constant velocity for entire cruise phase (majority of voyage). However, the cessation of propulsion will cause the ship to lose g-force from back of ship. To maintain Earth like gravity, occupants will have to reconfigure ship to maintain a controlled longtitudinal spin throughout the cruise phase. Thus, ship's spin will regain Earth like g-force by forcing contents against inside of outer hull. Deceleration Phase. Ship will need to end this trip by slowing down from cruise speed to an operational speed. At a predetermined duration prior to arrival, ship will apply propulsion vector against direction of flight. While acceleration phase directed exhaust particles toward Sol, departure; the deceleration propulsion vector will point in opposite direction, toward destination. Now, "up" will now be in the direction of Sol which is retreating from the ship, and "down" will be toward destination, which is getting closer.